Now available from Sierra On-line, Inc. is Space Quest III: The Pirates of Pestulon, starring space janitor extraordinaire, Roger Wilko. In this chapter of the continuing space drama, the authors, Mark Crowe and Scott Murphy, have written themselves into the game as the two guys who must be rescued before they are forced to work for the evil software manufacturer ScumSoft. The music for Space Quest III was written and performed by Bob Siebenberg, a member of the rock group Supertramp. As with other games created with Sierra's SCI (Sierra Creative Interpreter), MIDI output directly supports the Roland MT-32 and the Casio CZ-101 and MT-540. 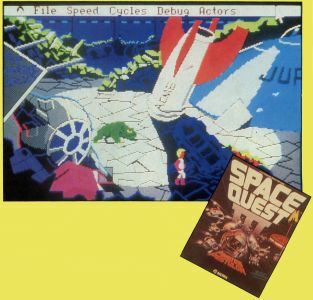 According to Sierra, "You need not have played Space Quest I or II to play Space Quest III, but Scott and Mark could use some extra royalty money."